I long for the days when we can experience all of the magnificent national treasures on Capitol Hill as they were originally imagined. The entry sequence and progression through spaces are carefully thought out by architects as buildings are designed. These experiences are very powerful and purposefully created with both direct and subtle clues to evoke a wide range of feelings and emotions. 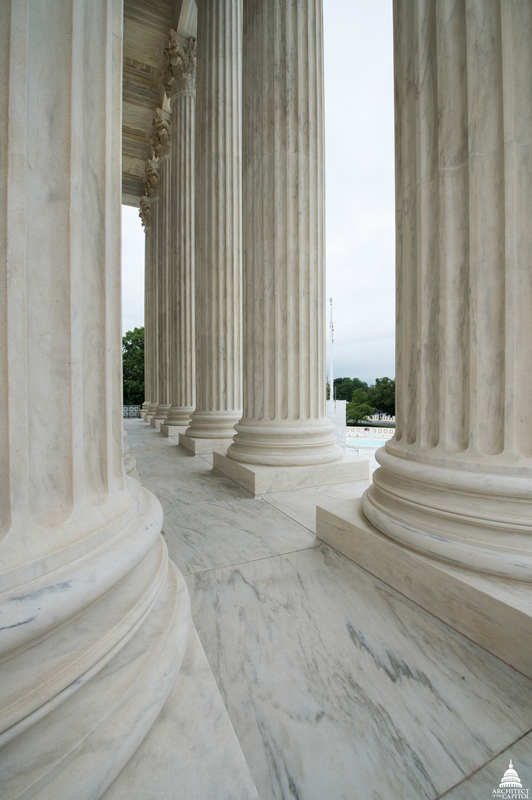 A portico of tall Corinthian columns gives the Supreme Court Building a monumental entrance. The entrance to the U.S. Supreme Court, for example, is designed with power, authority, grandeur and importance in mind. After ascending broad, sweeping marble steps, its portico's monstrous columns bulge in the middle and taper to the top, giving a sense of strength, weight and rising up to the ultimate authority. To enter the Library of Congress' Thomas Jefferson Building, two flights of stairs were envisioned. At the top, the grand entryway's lower ceiling gives the sense of anticipation before arriving at the opulent Great Hall. Sadly, acts of violence and threats to security have changed the way we experience some of our public spaces and building approaches at the Capitol complex. Instead of ascending the grand stairs, we now walk underneath or around them. The new routes are unfortunate, but vital for everyone's safety. While we have to make difficult decisions to ensure that our buildings, and the people inside them, are both served and protected, opportunities abound to return our buildings to the way they once were through our historic preservation efforts. The Capitol's Zodiac Corridor is a great example of restoring a building to its original vision. For ten years, this area was converted into a makeshift office space by a wall separating it from the rest of the Brumidi Corridors. Partnering with Congress, we were able to remove the wall and convert this space to its original glory. A similar return to original design will happen as part of the Cannon Building's renewal project. Imagine experiencing those restored hallways and seeing the corridor ends filled with natural light pouring in from windows currently obstructed by makeshift offices. I often think about what those who walked the original paths of the Capitol complex so many years ago must have felt and seen. I challenge you to do the same. Our imaginations are boundless. Stephen T. Ayers is the 11th Architect of the Capitol. This story is also published in the Fall 2016 issue of AOC's Tholos magazine. Stephen, Great blog! I agree - through preservation, there is both the possibility to maintain original design intent, and to insure people's safety by recognizing current contexts and realities. Mr. Ayers, thanks for composing such a thought-provoking piece, and thanks for your work to open up some spaces once thought to be only useful for overflow offices. One thought I had while reading your description of the meaning of the grand entrance stairs and how they have changed because of modern security needs. It could be nice for one week out of the year to set up temporary security stations so the public could use those entrances--such as the direct one into the Rotunda up the East Portico stairs--as they were intended by the 19th C. architects. I've always wanted to go in the front door of the Capitol Building and have never had the chance in my years of living in D.C. Such a unique program could be a meaningful short-term compromise between security and history--and make for a grand AoC p.r. event, too. Great goods from you, man. I have understand your stuff previous to and you are just extremely magnificent. I really like what you've acquired here, really like what you are saying and the way in which you say it. You make it enjoyable and you still care for to keep it smart. I cant wait to read far more from you. This is actually a tremendous site. To preserve for the future is a difficult task, I appreciate the work for today and every day. THANK YOU. Not an AOC Blog Subscriber? Is there a "whispering gallery" in the U.S. Capitol?